I like to see stocks which are near their high /low range . 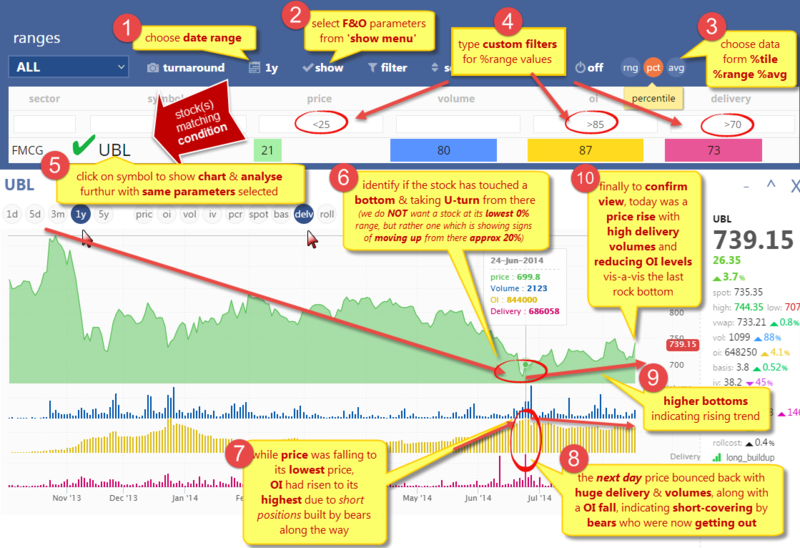 And not only in terms of price , but also other F&O parameters, especially Open Interest (OI) and Delivery. Why ? because OI itself is like a pressure cooker, there is a limit to how high can it go, and at the tipping point either the bulls or the bears will eventually give in, and the price would flow in the reverse direction. And if coupled with high delivery volumes, it is like a sure shot . But how do identify if these parameters are near their high/low ranges from so many F&O stocks in a quick & easy way? For this the “Ranges” screen in the MyFnO app comes real handy.